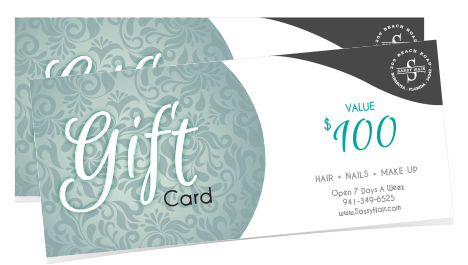 Instead of candy, breakfast in bed, or the infamous tie, give the gift of time – a gift certificate from Sassy. Who wouldn’t love a spa manicure & pedicure or customized facial? Away from it all and time for yourself. Don’t kid yourselves, men love to be pampered too and enjoy these services as well as the ladies. Please stop by or call us at 941-349-6525. Gift Certificates can be purchased in any amount or for any service.